An intense manhunt movie that keeps you riveted the entire way through. 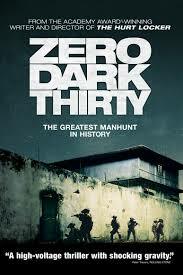 Zero Dark Thirty is a pretty fantastic movie! It’s gritty, dark, smart, and best of all, it keeps you interested. That’s the one thing I was afraid of going into this movie. I loved hurt locker, director Kathryn Bigelow’s last film, but it seemed like everything just went right for that movie. Like she got lucky. After all, The Hurt Locker was on a different playing field than any of Bigelow’s previous movies (Point Break, Strange Days), and it really was different than any movie we had ever seen. That film was a unique experience of testosterone and creativity. Could this director really do it again? The answer is yes. Now, Zero Dark Thirty isn’t nearly as good as hurt locker, but it’s still a lot better than one might imagine. This movie is long and it needed to be long. On top of that, it didn’t really feel long. That’s because the story is gripping and the conversations and events pull you in. even when the movie is trying to tell you that it is long (when CIA operative Maya, played by Jessica Chastain, writes the number of each day on a window to show how much time has gone by), it still feels powerful and intense. Perhaps that’s because of the subject matter. This is, after all, the story of the greatest manhunt on earth. That might be the tagline of the film, but it’s also true. And I love how the movie takes us through it with details and small steps. There’s no starting at the end with a flash forward, like many movies do these days, or any cheap tricks like that. Instead, this movie is a straightforward narrative where it’s beginning is nearly as captivating as it’s end. That beginning is all about torture. At the start of the film, Maya has just joined this branch of the CIA and been sent out to Pakistan. She is witnessing her first torture session; they’re as a spectator, watching a guy whom is a pro at his job going to work. That guy is Dan, played by Jason Clarke, and he’s a character who stays with you. He’s really only in the first half of the movie (aside from brief appearances every now and again later on), but that’s a good thing. It gives the first half of the film character and distinguishes it from what will come later on. Dan knows all the tricks. He knows how to torture a terrorist and still not seem like a bad guy. After all, he is pleading with the terrorist to speak, telling the guy that he doesn’t want to hurt him. And we believe him. When Dan tries an alternative technique, attempting to convince a terrorist that he already gave them information, when really he gave them nothing, things take a creative turn. The idea here is to get the terrorist to let down his guard a little and stop being so strong-willed and defensive. Pretty clever stuff. The first half of the movie is really all about searching for clues. It’s a struggle, and it takes a while and I like that Bigelow isn’t afraid to let us feel the same way the characters probably do. It’s nearly halfway into the film when mark strong first appears as the ciao director in charge of the Pakistan operation, and reams out everyone on his team for not having found anything yet. But that’s not to say that the movie has been uneventful. There was one restaurant bombing with Maya right in the center of it, and then another wild scene coming up after that. For that second scene, we really get to see why Bigelow is such a great director. It’s a scene where we know something bad is going to happen. We know to be suspicious and on our guard. In fact we even pretty much know what is going to happen. Only the way this movie handles it, with the perfect combination of leading camera shots, and haunting music is just great. Every moment leading up to what will happen is like watching master artist paint with her brush. The word predictable doesn’t even factor into this scene. They’re letting us know what’s going to happen and still impressing us with the way they go about it. And then it’s time to find Bin Laden. It’s not so easy of course, and I like the way the movie still takes its time following clues. James Gandolfini appears in the second half the film as the big boss on the scene and he has two terrific meeting scenes. In the first one he meets Maya and she makes a big impression. One that will not be forgotten. She does this all with just one line. And then in his second scene he goes around the room asking for each person’s opinion about the potential raid they are considering. The actual raid that we all know will end the movie is also great, but not necessarily any better than the things that came before it. For those craving only action, this is probably what you’ve been waiting for, but like hurt locker, the movie isn’t really about that. It’s about the circumstances and situations and what it feels like to be there, in the moment. For that reason, the raid is detailed and takes time. Even the actual figuring out of whether or not they got their target is shown in detail. With Zero Dark Thirty, Kathryn Bigelow proves that hurt locker was not a fluke. It wasn’t a lucky break. She really is a gifted filmmaker telling the best real life stories around. With this movie, she dives head first into details and yet still keeps us pinned to our seats. There isn’t anything too complicated in this movie that it turns the audience away, and that’s also a testament to how well the movie was made. Like The Hurt Locker, the film might deal with real world and semi-political issues, and might put us right there in the forefront of it all, but it still manages to make it relevant to our own daily lives. There are so many things to love about this movie, but one that still stays with me is the way the film addresses the change of administration from bush to Obama and the way the CIA has to move away from using torture. We get to see Obama on TV talking about this and hear a conversation where Dan gives Maya advice about not wanting to be the last one holding a dog collar. This movie had so much to tackle, that it didn’t really have to get into this, and the fact that it did, just shows how much it is willing to go the extra mile.